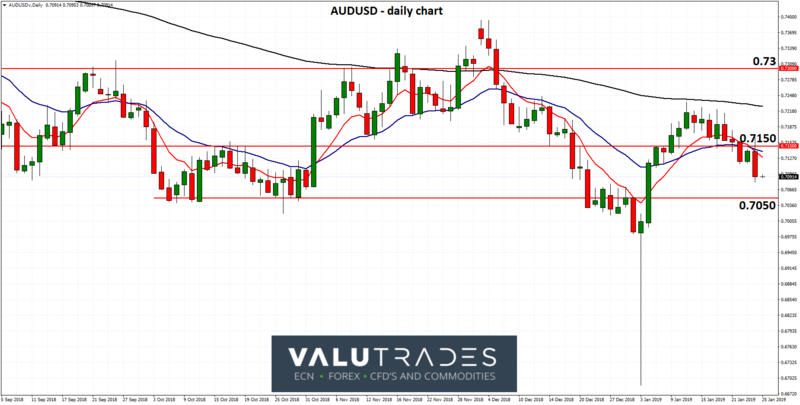 In the last week or so the AUDUSD has slowly but surely eased lower, and whilst it received some support from the key 0.7150 level for a few days, it has continued lower to a three week low back within the range between 0.7050 and 0.7150. Just prior to the decline, the AUDUSD had done very well to rally from its lowest level in many years below 0.67 up to a five week high a couple of weeks ago. You would have expected the support at 0.7150 to stay strong for longer, however it has since moved lower showing how strong the sellers are presently. The AUDUSD didn’t finish 2018 very well falling strongly throughout December to hit a three year low just below 0.7050 before dropping sharply down to below 0.67 and regaining lost ground just as quickly as it fell. Despite concerns about a global growth slowdown which includes Australia, the Australian job data has surprised with the unemployment rate easing to 5% in December.21,600 new jobs were created which was better than all expectations, however the majority of these additions were part-time positions with 3,000 full-time jobs being lost over the month. By historical standards, participation rates still remain high however the unemployment rate was helped by a minor reduction in the number of people looking for work.Interestingly, the data seems to contradict other economic indicators, for example inflation, growth or house prices.Many would expect employment growth to ease this year given the softer economic conditions, including falling property prices. The unemployment data is the equal lowest level of unemployment since June 2011, in seasonally adjusted terms. "Over the past year, trend employment increased by 284,100 persons [2.3 per cent], which was above the average annual growth over the past 20 years [2 per cent]," the Australian Bureau of Statistics release noted. The state of Victoria now leads the nation in terms of the lowest seasonally adjusted unemployment rate at 4.2 per cent, slipping past New South Wales, which held steady at 4.3 per cent.